The rate at which Npower beneficiaries panics each time they hear that FG is not planning to absorb them into the civil service get me thinking about what N-power programme holds for the future. The N-power Programme which I believe is an initiative created by the FG to create jobs and reduce unemployment situation in Nigeria should do the needful in making sure that this bunched of experience graduate do no go back and join the fresh pool of unemployed in the labour market. 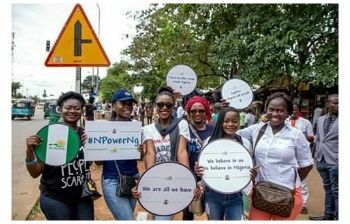 Since one of the plan of this administration is to reduce poverty, the N-power volunteers can help them on this cause, teach the Npower Volunteers how to fish rather than giving them fish and in turn they will employ one or two Nigerian thereby reducing the unemployment situation. Out of 360 Nigerian 1 is an N-power volunteer. Imagine the impact of this volunteers to the economy of Nigeria if the government can genuinely train them to give back to the society. Federal government should not leave the same State Government that were jealous due to the fact that they were deprived of this opportunity to recruit their own candidates into Npower, the same State Government that made fruitless attempt to replace 2016 Pre-Selected Npower Volunteers alone to handle the future of the Npower volunteers. There is no doubt that the programme is doing well in the lives of Nigerian youths but a lot need to be done to perfectly meet the aim and objectives of the scheme in creating jobs. When you look at beneficiaries panicking reactions when ever they hear that there will be no absorption, you begin to wonder whether the programme has really build the confidence in volunteers to be able stand alone on their own. What is the benefit of posting volunteers to teach, serve as agric and health extension worker if they will not be gainfully employed to provide services with the experience they have gain. The non graduate Npower beneficiaries stand a better chance of becoming entrepreneurs because of their orientation than the graduate volunteers. The enhancement should focus on how to practically train the graduate beneficiaries to stand on their own if they FG is not capable or willing to absorb beneficiaries.